The interview — during which The Times said Musk “alternated between laughter and tears” — comes amid the turmoil the Tesla (TSLA) chief triggered last week when he tweeted that he had secured funding to take the electric car maker private. 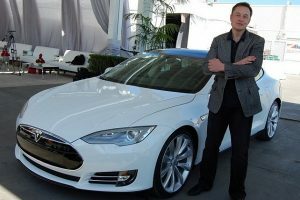 The electric carmaker’s founder has been facing intense scrutiny about the 7 August tweet which said he wanted to take Tesla private at $420 a share. He told the New York Times that the price of $420 seemed like “better karma” than $419. “But I was not on weed, to be clear,” he said. 4/20 is an infamous term, more common in the US, that refers to the consumption of cannabis. The price of $419 would have represented a 20% premium over Tesla’s share price at the time. “It seemed like better karma at $420 than at $419. But I was not on weed, to be clear. Weed is not helpful for productivity. There’s a reason for the word ‘stoned’. You just sit there like a stone on weed,” Mr Musk, 47, told the paper.